As you may know, March 14 has been highlighted as a day for students across the nation to honor the lives lost in Parkland, Florida, on Feb. 14. With the nation’s attention focused on issues of school gun violence, student safety and civic engagement, this is a tragic but teachable moment for our students – and for all of us. While our policies do not allow us to condone or participate in a walkout, as some have called for, we can offer an affirmative message to your students that we, like they, are grieving and angry about yet one more mass shooting in a school. I would like to let you know how we, as a district, plan to respect and support the voices and actions of our students while also ensuring their safety. My hope and expectation is that we spend time on age-appropriate lessons about what constitutes a safe, supportive and inclusive learning environment, that we allow students to express their views and that we encourage civic engagement on this issue. I have asked school leaders to give some attention and planning for a visible, school-wide event on March 14 to begin at 10 a.m. and last 17 minutes in honor of the 17 students and educators who lost their lives at Marjory Stoneman Douglas High School. This could take the form of students and staff joining hands in a circle on the playground, families joining their students for a peaceful walk around the school grounds or some other activity. Please check with your school principal about plans for that day. No student or school employee should ever feel unsafe when they walk into any classroom or office at Portland Public Schools. We will continue to do all we can to ensure our schools are safe, welcoming and supportive for everyone. Thank you for your support. Like Superintendent Guerrero, I’m thinking about the relationship of schools and society in the midst of scary and violent times. How do we cope with all the things that might make children feel unsafe at school, let alone the fear that someone might shoot them there? How do we keep children safe? How do we support parents? How do we find a productive way to navigate the relationship between thoughts and feelings and action? What do we do when we don’t know what to do? Do we convince ourselves– so that we can convince others– that we have it under control? Do we tell people they shouldn’t feel unsafe and ask them to be satisfied that we are doing all we can do? Do we focus on how tragedy lends itself to being teachable? Do we look for a way to vent the steam building under the pressure of our policies just enough so that we don’t explode? Where do we carry our grief, our rage, our fear? Because our school’s guiding principles include a role for families as partners, we have a structure we call the Opal Advisory Council– a group of parents who have agreed to meet together once each month to consult with Opal Staff on a variety projects central to our work. The meeting is open to the school community, and held in the evening in one of our classrooms. Because our values include a deep respect for differences however they may be expressed, and a belief that diversity strengthens community, we wanted to ask parents for their ideas on how to address the National School Walkout. After reviewing our own current safety policies and protocols, we handed them a copy of Superintendent Guerrero’s email along with a copy of this letter written by Hand to Hand Parenting’s Julianne Idleman. We were curious about what they noticed as they read the two side by side. One parent, who had read the email earlier in the day, brought her rage into the room saying, “The Superintendent’s email felt like a big f-you and it made me want to say it back to him.” In her words I recognized what happens when we try and take the emotion out of a charged situation that demands it. It hurts. It isn’t only the children’s grief and anger that needs validation. Parents need it, too. All of us need to feel validated for the hurt we feel. It’s the only way we’ll be able to put our “f-you”s aside and listen to each other with care. The conversation turned for a while towards the issues facing these parents of very young children who are trying to raise them in an uncertain world. Tears fell around the room and we found comfort as we shared our grief with one another. Those validated feelings turned quickly into a powerful solidarity. We asked the parents to work in small groups to brainstorm ideas about what they would suggest we do alongside their children on March 14 at school to connect with the National Walkout. They shared their fears about their children learning more details about Parkland’s tragedy. How can we do our part to ensure that this current swell of voices remains loud and gets even louder? How can we do this and at the same time respectfully remember that this isn’t only about the 17 lost in Parkland? How can we strengthen connection between our fears and the fears of families all over our country that cope personally with the rage of injustice, the grief of loss and an everyday fear that their children aren’t safe in school or anywhere else, and make sure our calls for change are supportive of those who have been calling for generations? I brought forward a copy of Let the Children March by Monica Clark-Robinson, published in January this year that was sitting in the classroom. This text helped me remind them that not only are children strong and capable, but also willing and eager to stand up for what they want to see in the world – and that there is strong precedence for this. Children have the power to remind us of what we wanted for ourselves. That can bring us to tears, but it can also move us forward. 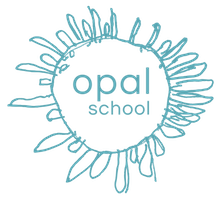 There was also, among the parents, in the spirit of the Hand to Hand article, a suggestion to do nothing on March 14, but to remember that Opal School’s approaches are guided by a set of values and principles that amount to doing something every day. We are growing a citizenry that is emotionally intelligent, comfortable with uncertainty, and committed to civic action. It is our daily work to “spend time on age-appropriate lessons about what constitutes a safe, supportive and inclusive learning environment.” We go far beyond “allowing” students “to express their views.” We rely on the expression of their views to drive the curriculum forward. We rely on the gifts of childhood to courageously and collaboratively question what it means to be a citizen world-maker in the midst of uncertainty. That is our practice. As a community, we are grief-stricken, fearful, and full of rage. The urge to stand behind policy is reasonable. It makes sense for those in charge to wish to maintain control by restricting responses to those intense emotions to 17 minutes. It’s frightening to imagine what could happen and what we might be held accountable for. It’s frightening for me to imagine what I might be accused of as I write this. But I believe that in order for us to get where we all want to go — where we all can count on our basic human rights — leadership must be even more collaborative and more courageous than we might even imagine possible. We need to invent new memories of how it can work when we work together. As much as I value the sentiments shared in Ms. Idleman’s Hand to Hand letter as a parent and as a teacher, those of us in charge need to recognize that, right now, loving our own children is simultaneously enough and not enough. We need to ensure we are loving other people’s children as fiercely as we love our own. If we want to see change, those of us in charge have the responsibility to figure out how to get people there, even as we’re admitting that we don’t know how. We need to focus on what is possible instead of what is wrong. We need to ask children what they think, and we need to help them learn the countless ways there are to tell it to the world. By the end of our meeting, the parents who were there looked forward to our next parent meeting that will be held Tuesday (3.13.18) — one day before the National Walkout. This meeting had been scheduled early in the year to discuss the project work unfolding in each classroom. The Advisory Council recognized an opportunity to talk about these wider issues, with more community members, in the context of the work of the school. To these parents, that felt exciting and also scary, and that made us all recognize that there we were, being courageous and collaborative, almost without even trying. One parent reminded us how important it would be to communicate the intention to highlight these connections because people need to be prepared to encounter their own strong emotions. They need to know they have a safe space to do that so they can find out that when they share their emotions they are likely to hear other people’s stories. And once we know each other’s stories, well, we aren’t likely to hurt each other anymore. We feel validated, connected, and not alone. The only way we get out of this mess we’ve made is by going through it – together. We don’t get to the other side until we can do it together. Schools are the best places to make that happen because schools are full of children who remind us why we need to get to the other side even though its hard. They offer us the courage we need to do the work. Going through the mess is going to be messy. Those of us in charge need to figure out how to do our work without trying to control the messiness of the process of relationship building. We need to expect it to be hard, emotional work. We need to see it as our job to facilitate and support the fearful and the grief-stricken and the enraged, even though we might not really know how. We can’t be sure we’ll do it right. But this is the work. No one else is going to do it for us and nothing will change until we do. This post is getting long and so I’m going to sign off for now. I want to tell you about the work the teachers did the following day, and the work the children did the day after that, and about their plans for March 14. So I’ll write again soon. In the meantime, I’m curious about how your communities are responding to this moment, and I hope you’ll share.